ArchitectureChicago PLUS: Ancient Rome, David Rockwell style - Nero's rotating dining hall found? Ancient Rome, David Rockwell style - Nero's rotating dining hall found? Its size and splendour will be sufficiently indicated by the following details. Its vestibule was large enough to contain a colossal statue of the emperor a hundred and twenty feet high; and it was so extensive that it had a triple colonnade a mile long. There was a pond too, like a sea, surrounded with buildings to represent cities, besides tracts of country, varied by tilled fields, vineyards, pastures and woods, with great numbers of wild and domestic animals. In the rest of the house all parts were overlaid with gold and adorned with gems and mother-of‑pearl. There were dining-rooms with fretted ceils of ivory, whose panels could turn and shower down flowers and were fitted with pipes for sprinkling the guests with perfumes. The main banquet hall was circular and constantly revolved day and night, like the heavens . . . 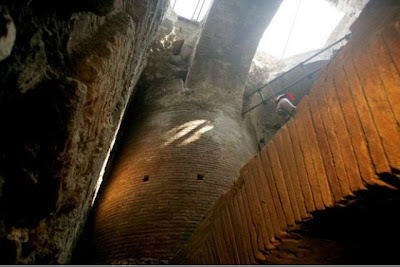 The supposed smoking guns of the recent discovery on the Palatine hill include a 50 foot diameter room, resting on a 13 foot in diameter pillar, with a rotating mechanism underneath - "four spherical mechanisms likely powered by a constant flow of water that would have rotated the structure." Jerry Kleiner was reported to be on an early flight to the Eternal City.